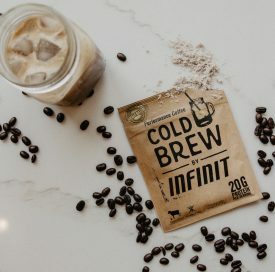 cincinnati, OH, u.s. — Infinit Nutrition introduces a unique product as the latest addition to their line of premium protein and recovery formulas: Cold Brew Performance Coffee is an exclusive blend of coffee brewed low and slow, lightly sweetened and blended with a hint of real cream, plus packed with 20 grams of premium grass-fed whey protein. Artisan picked coffee beans, carefully brewed at a low temperature over hours, provides Cold Brew with a deep smooth flavor that is characteristic of a high quality cold brewed coffee. The distinctive brewing process also provides its naturally high caffeine content — with 100mg of caffeine per 10 ounce serving. Cold Brew is blended with an exclusive whey protein isolate that is certified grass-fed, non-GMO, rBST and artificial hormone free. The premium protein is produced from the milk of dairy cows who have spent an average of 300 days grazing in Ireland’s lush pastures, and farmed with a special focus on animal welfare and environmental responsibility. The café-style drink mix is perfect for a post-workout boost or a nutritious pick-me-up throughout the day. With less than 10 grams of cane sugar and only 135 calories per serving, it is a tasty, yet healthy choice for any coffee lover who might also be trying to increase their daily protein intake. Infint Nutrition was started 15 years ago by a group of guys that were multiple IRONMAN Kona finishers, and has operated primarily as an endurance hydration and fueling company since its founding. The launch of COLD BREW is a continuation of the company’s diversification and expansion into the premium protein and recovery market, and it joins their Performance Café line, alongside the popular MUD pre-workout and meal supplement. For more information on Infinit Nutrition, or to check out the full Performance Café line of products, visit infinitnutrition.us. To learn how to incorporate this product into your nutrition plan visit infinitnutrition.us/let-us-help.